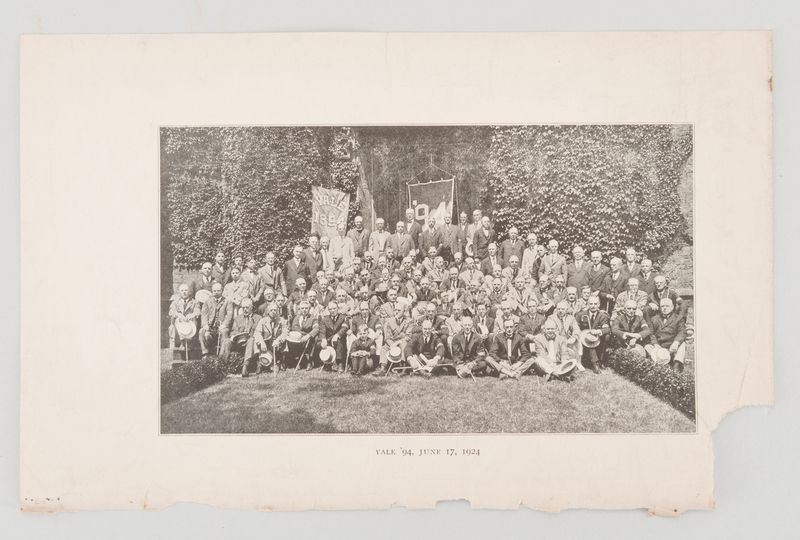 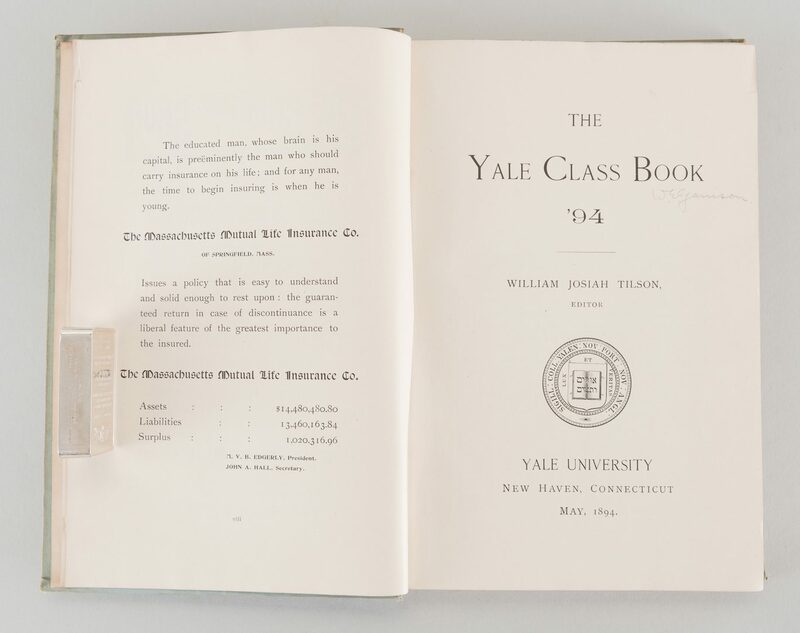 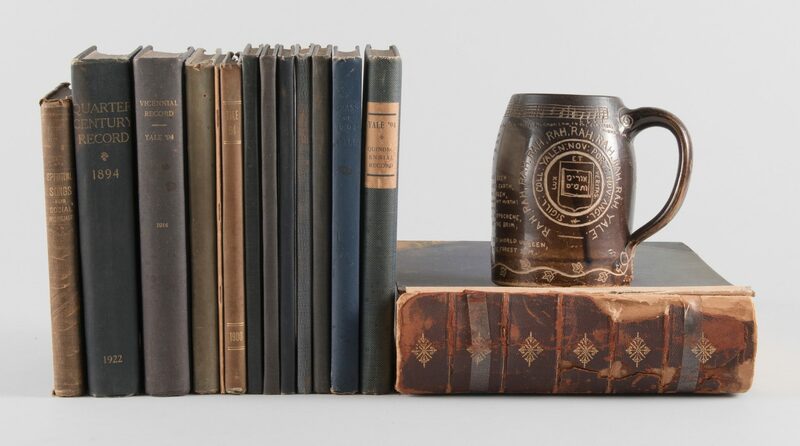 1894 Yale University Graduating Class Archive and Drinking Mug. 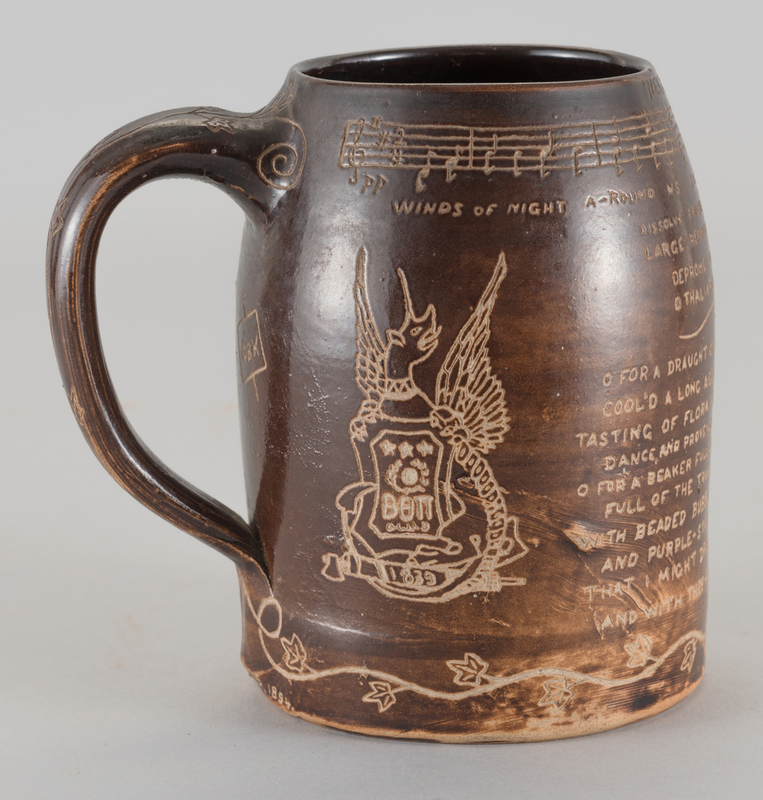 1st item: Stoneware mug with Albany slip glaze and sgraffito decoration, including vine decorated handle, the sides decorated with a winged griffin, Phi Beta Kappa symbol, musical bars of the song "Neath the Elms," with Latin inscription followed by poem, "O for a Draught of Vintage, that hath been cool'd a long age in the deep delved earth, tasting of flora and the country green, Dance and provencal song, and sunburnt mirth! 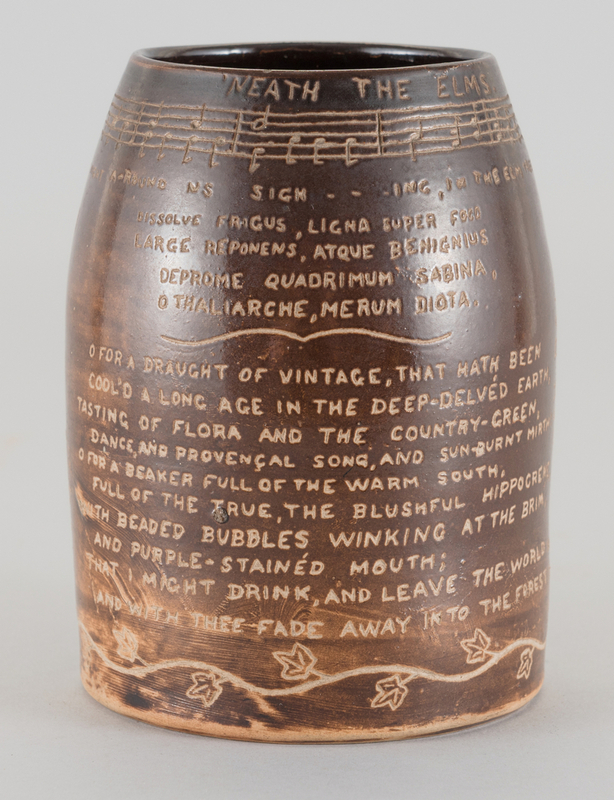 O for a beaker full of the warm South, full of the true, the blushful hippocrene, wtih beaded bubbles, winking at the brim, and purple stained mouth; that I might drink and leave the world unseen and with thee fade away into the forest dim." 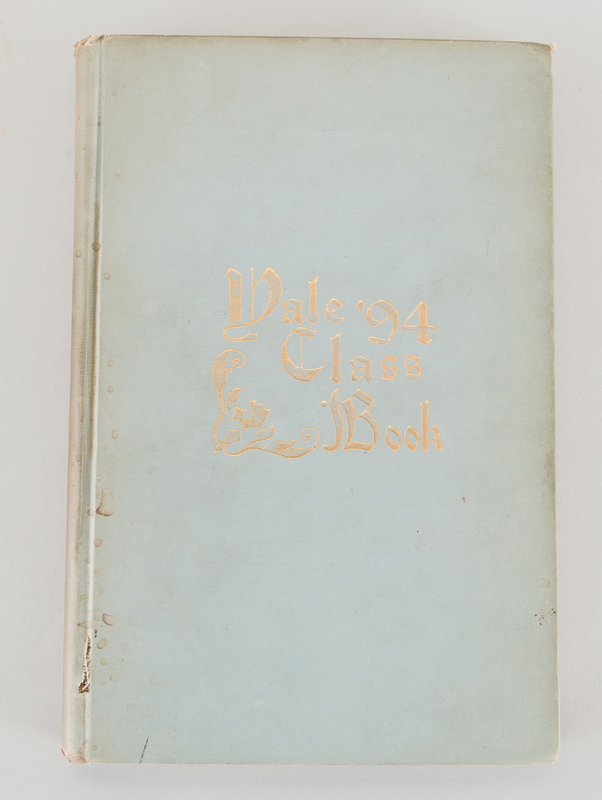 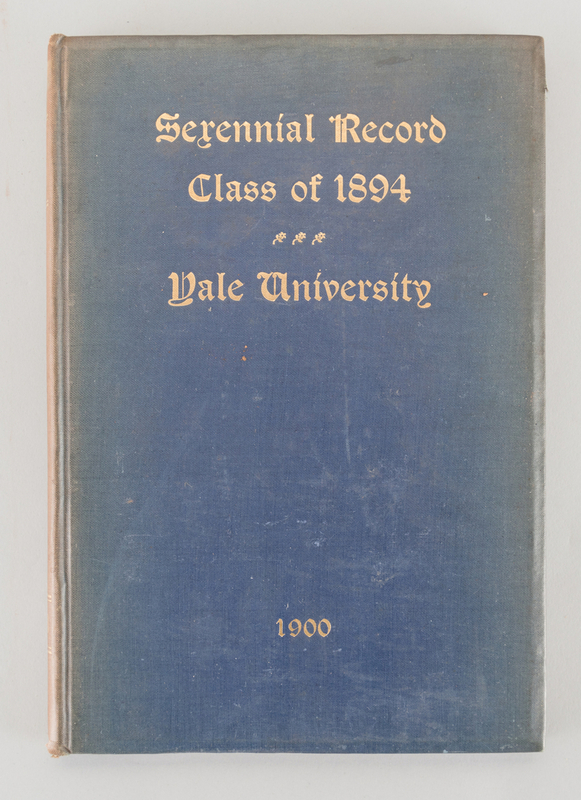 Dated June 5, 1894, with sgraffito inscription on underside: Yale 1894 W.E. 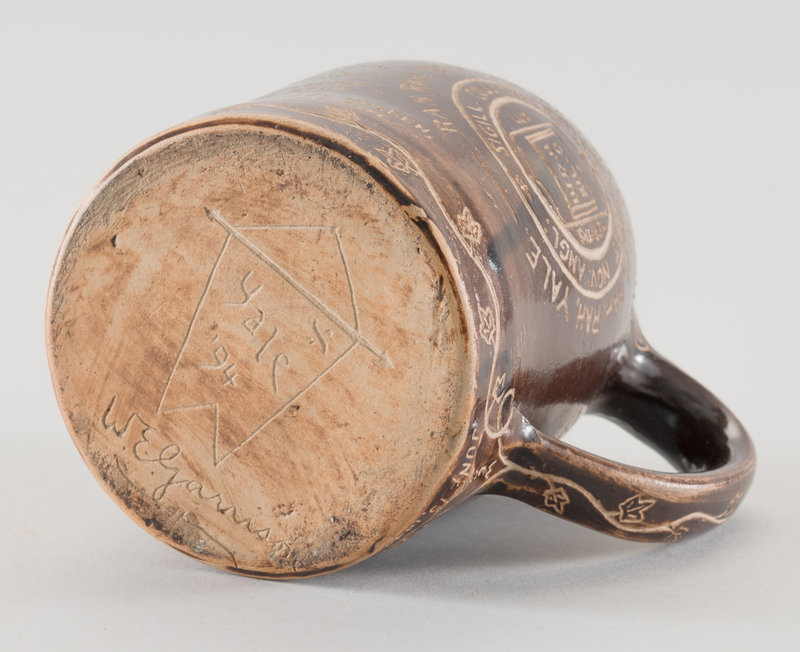 Garrison. 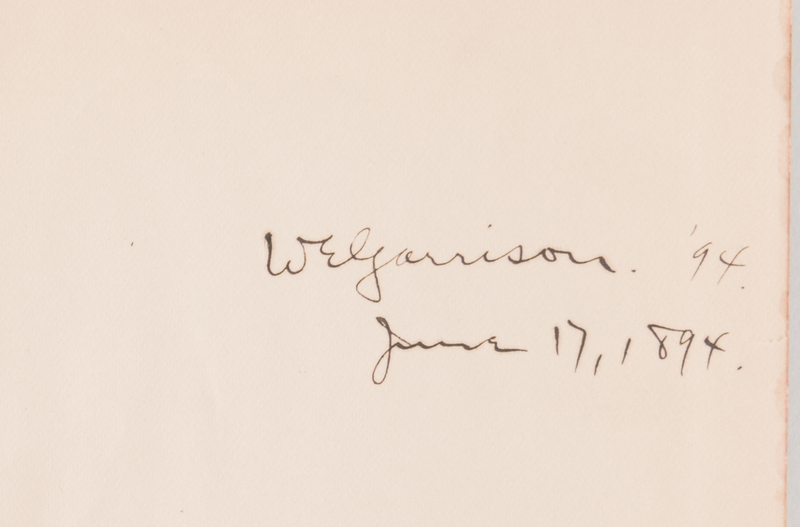 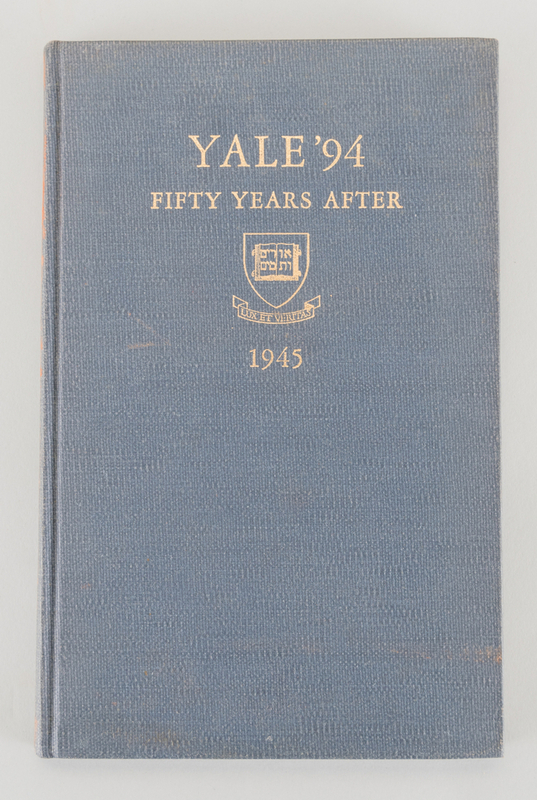 5 1/2"H. Note: Winfred Ernest Garrison, originally of St. Louis, graduated Yale and went on to work in academia. 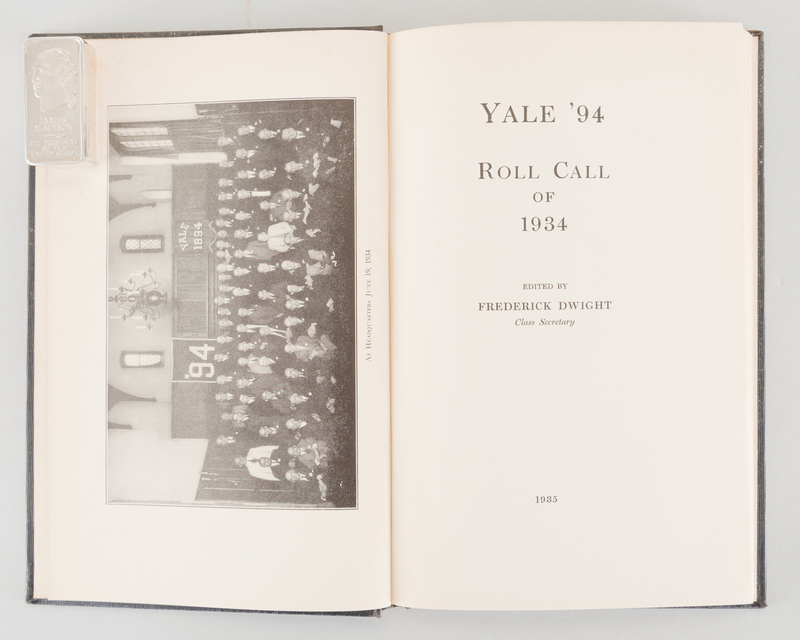 He established the Claremont Preparatory School for boys, served as President of Butler College, New Mexico Normal University and New Mexico College of Agricultural and Mechanic Arts. 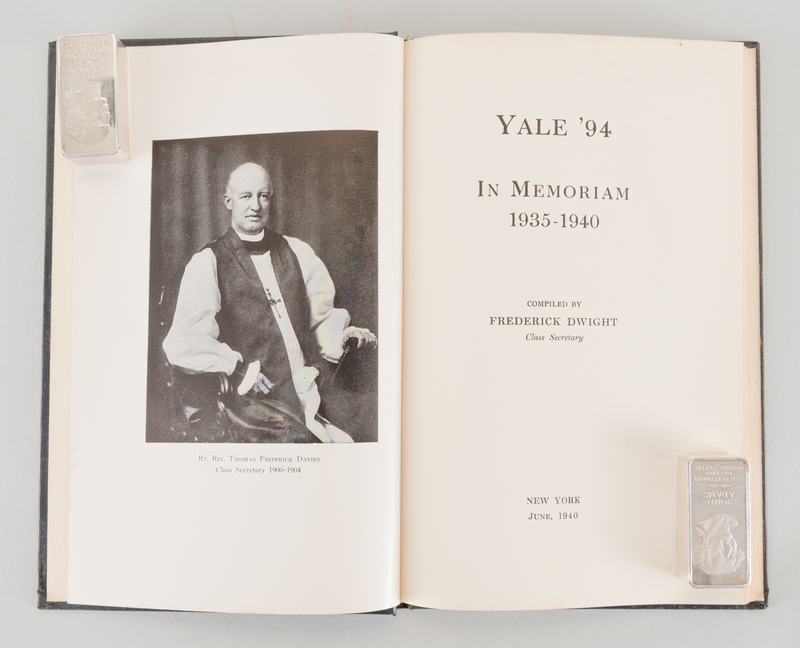 He was a Trustee of Pomona College, and served as a member of the Constitutional Convention of New Mexico which framed the Constitution under which that territory was admitted to statehood. 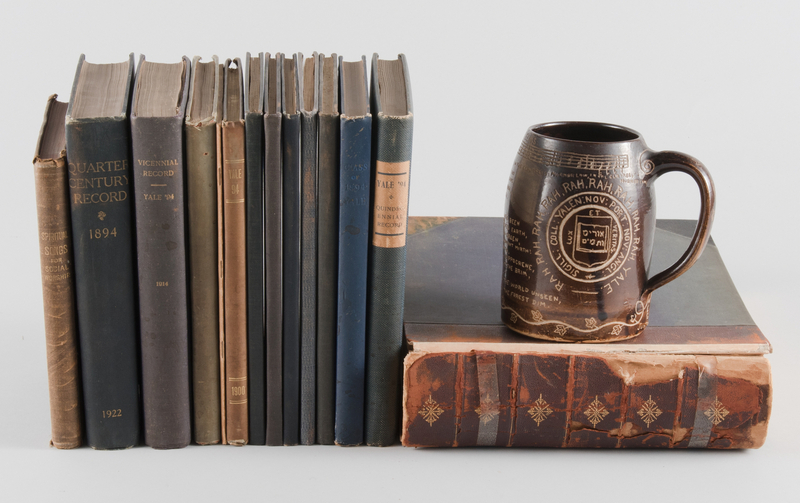 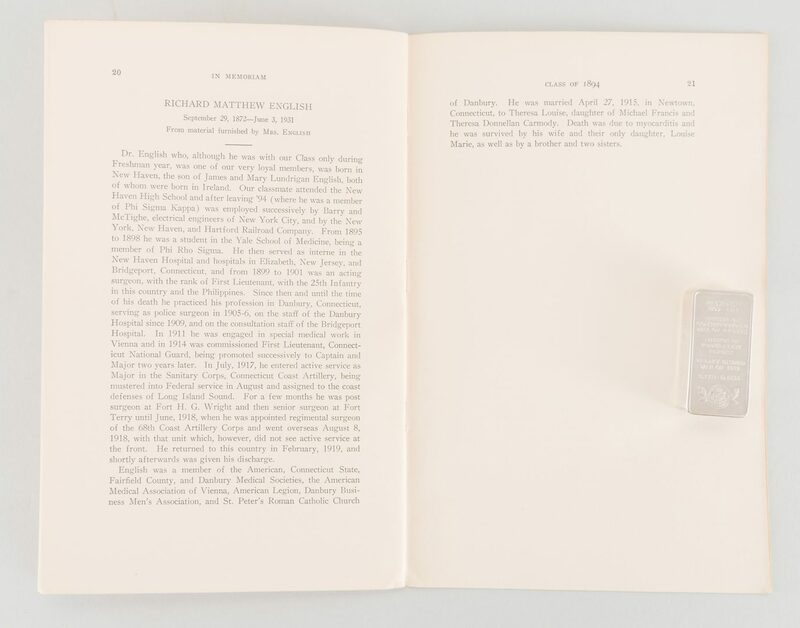 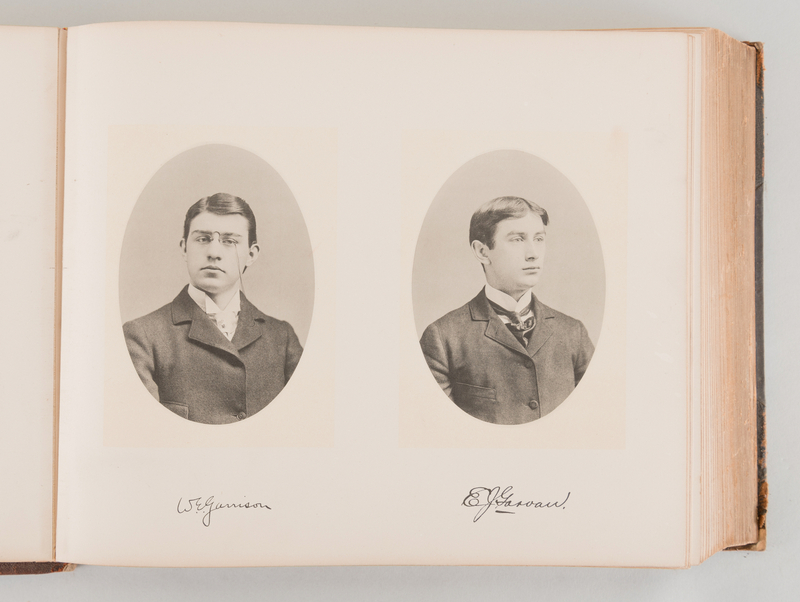 The archive included with this mug appears to have belonged to him as well, as his name is circled in pencil in the 1894 Yale Class Book next to his photo, and inscribed in pencil on its title page. 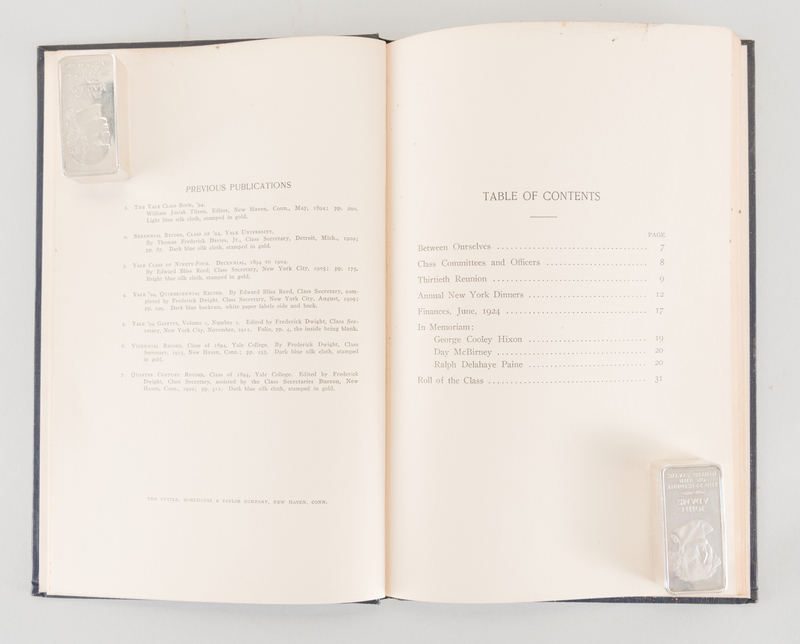 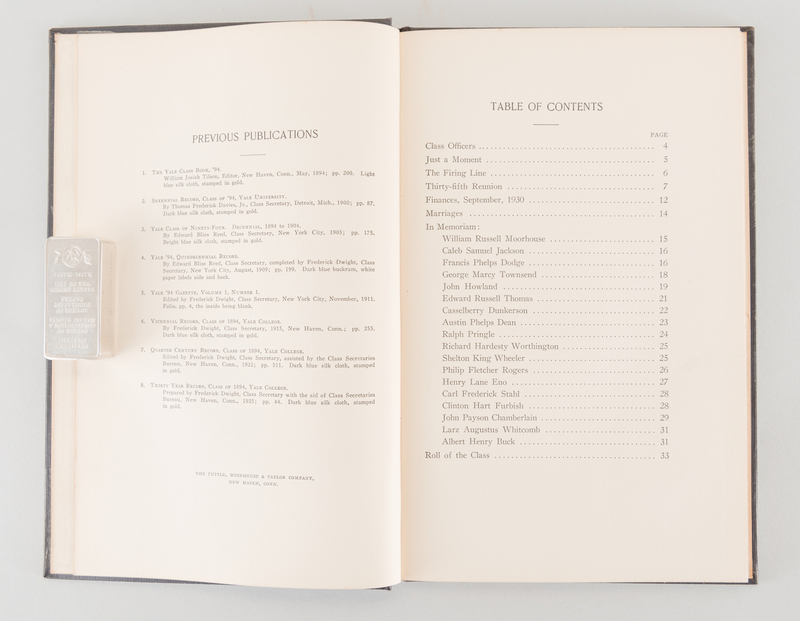 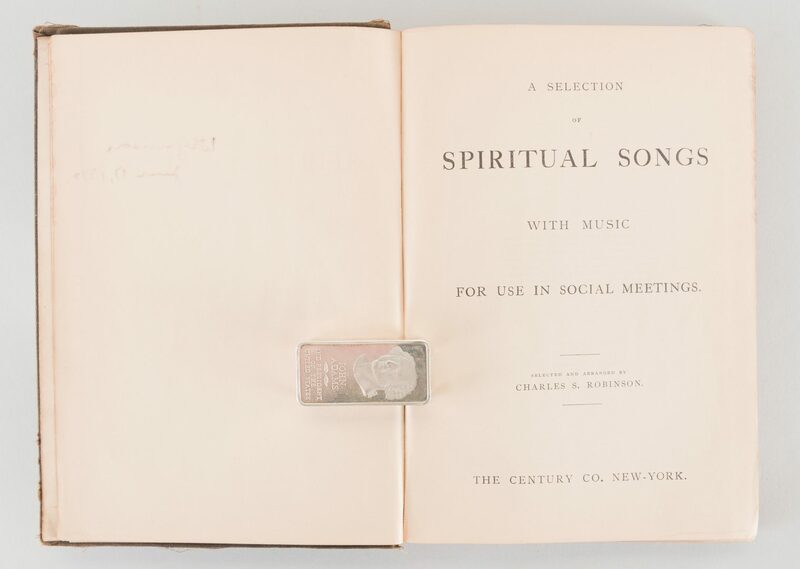 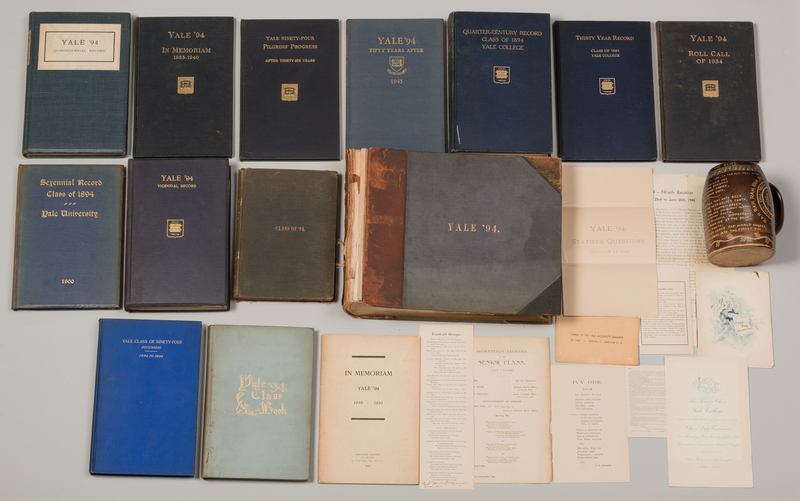 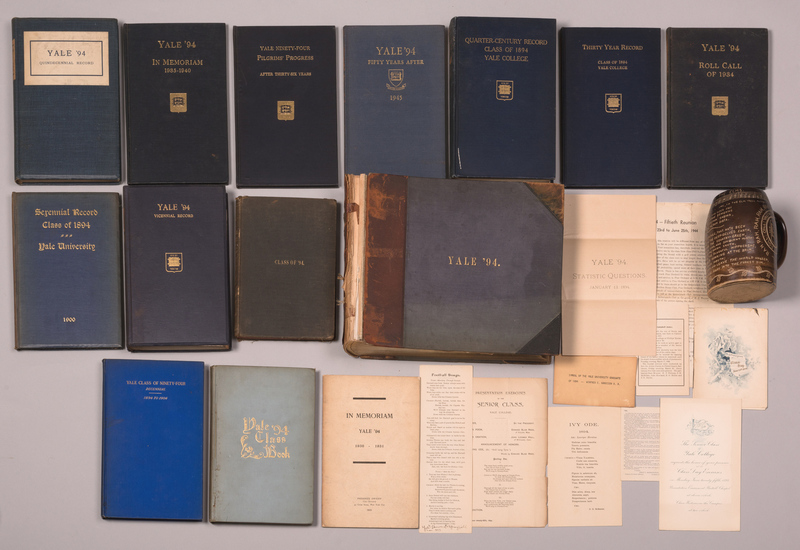 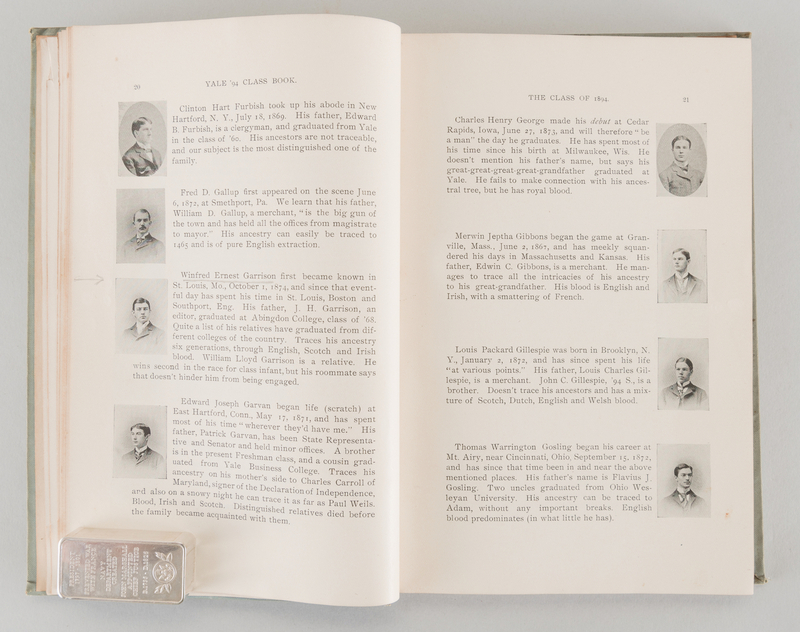 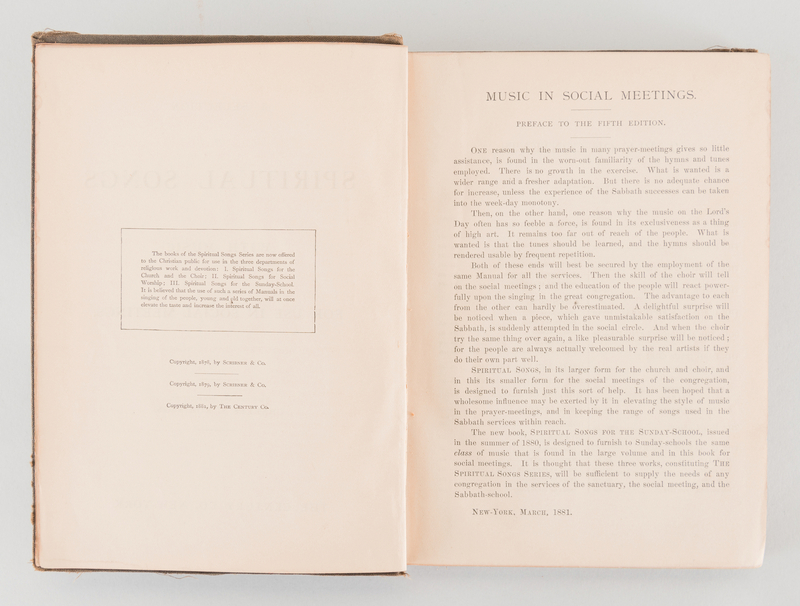 In addition to that book, published 1894, there is a songbook, "Spiritual Songs for Social Worship," and record books updating the status of the graduates (containing some black and white photos) published 1900, 1905, 1909, 1915, 1922, 1925, 1930, 1934, and 1945, and two "In Memoriam" Books (1930-1931) and (1935-1940). 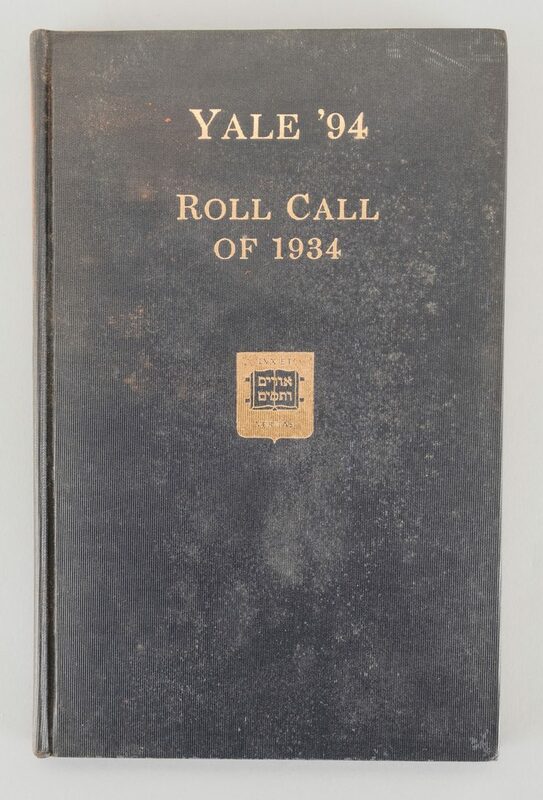 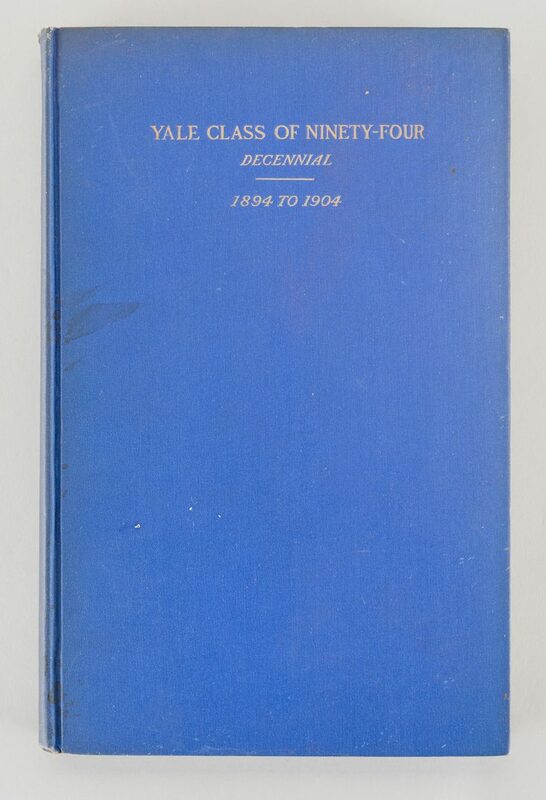 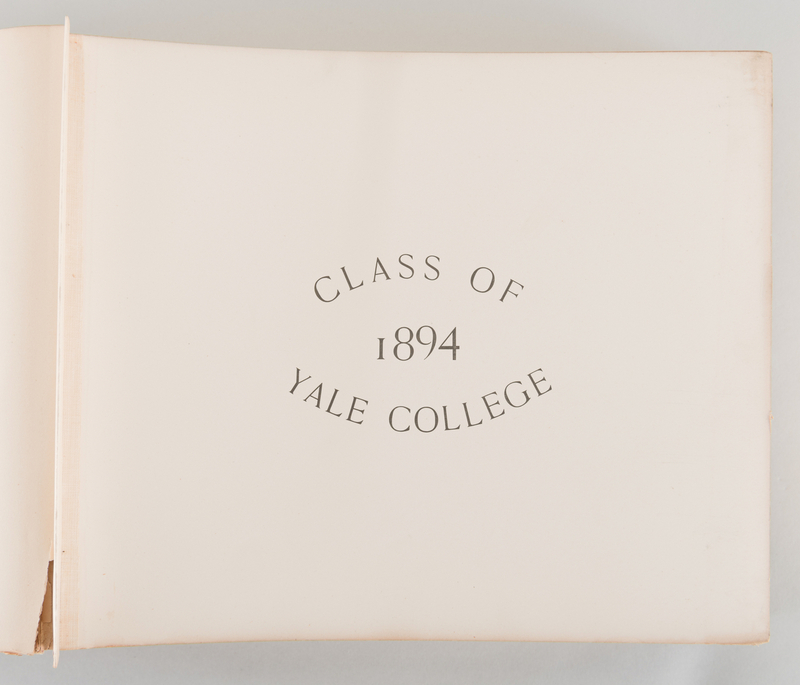 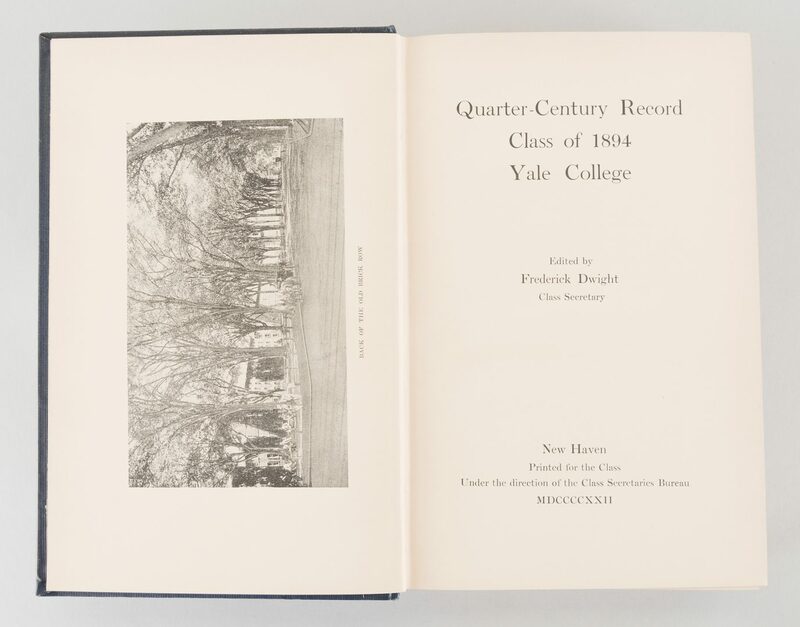 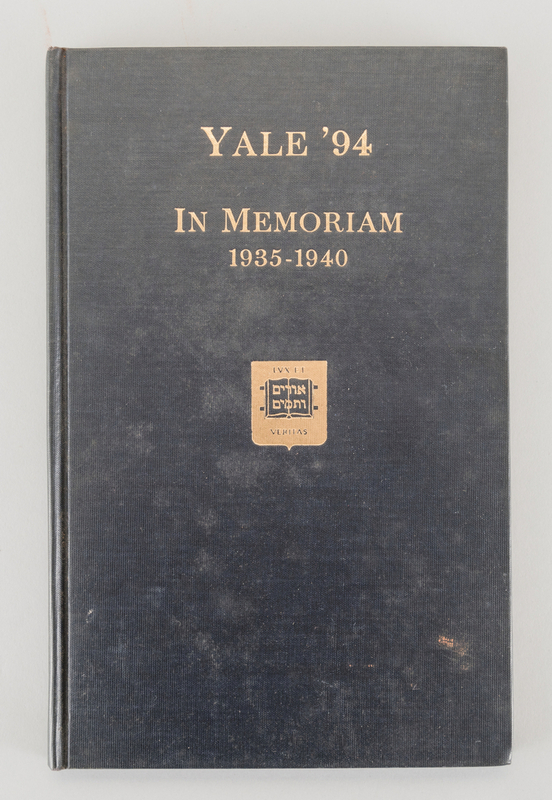 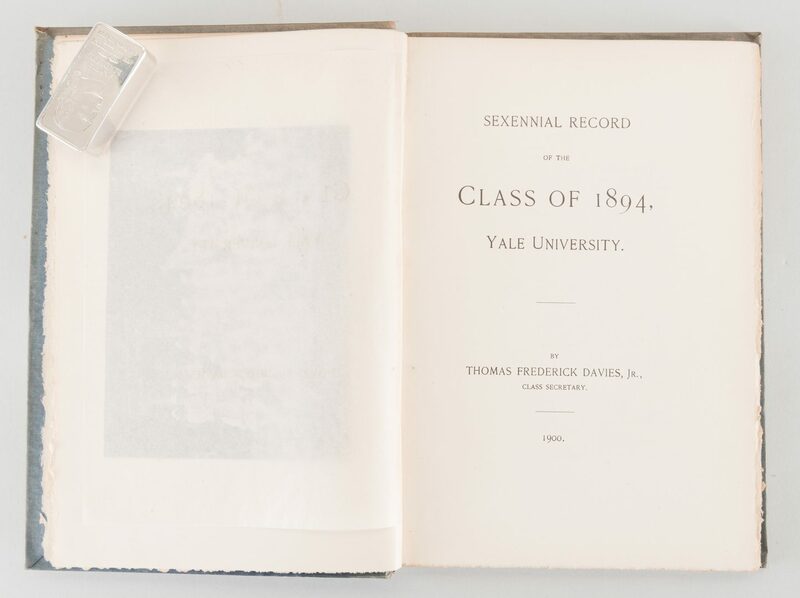 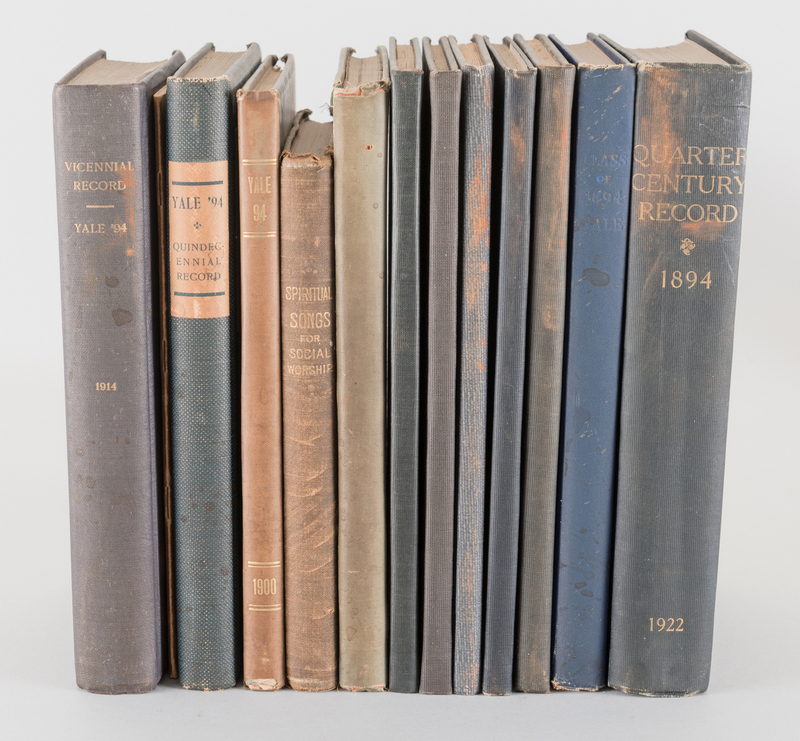 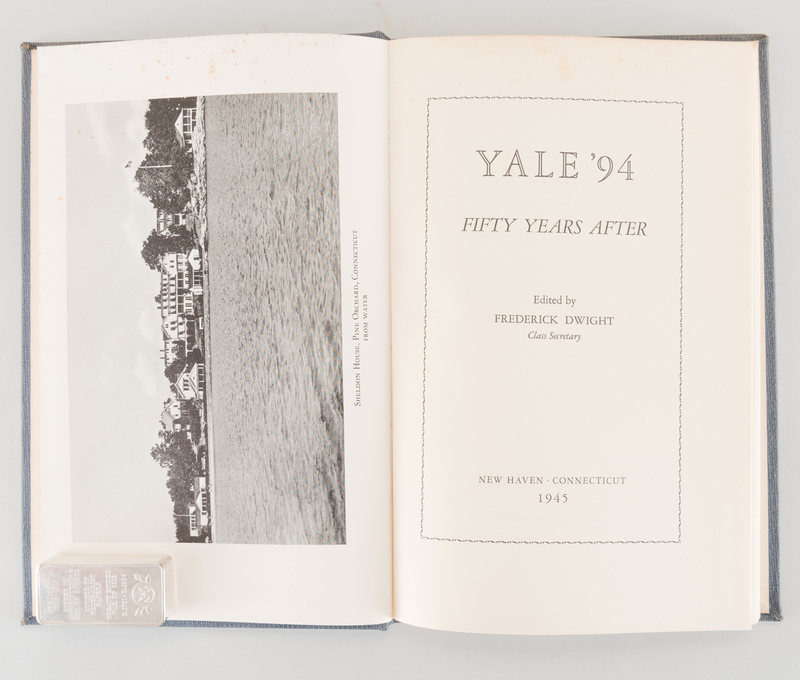 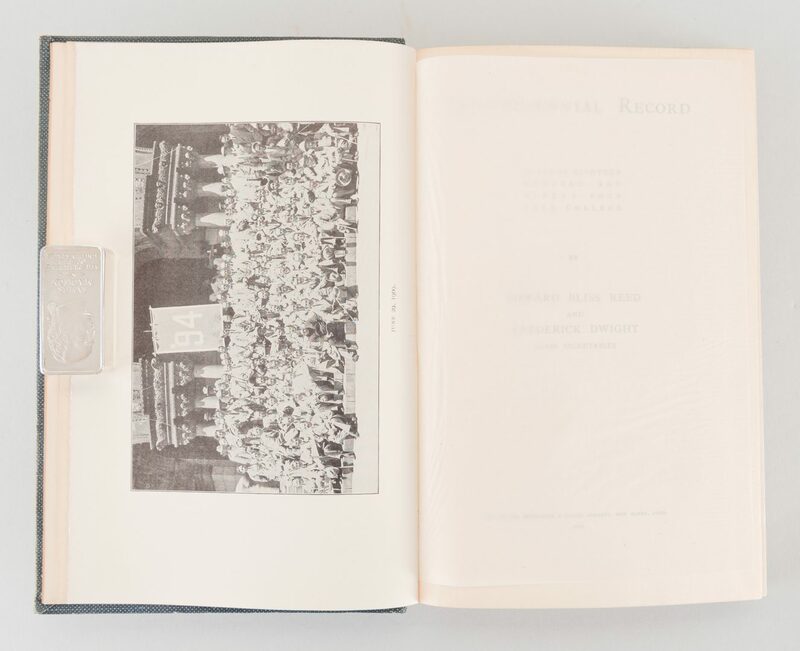 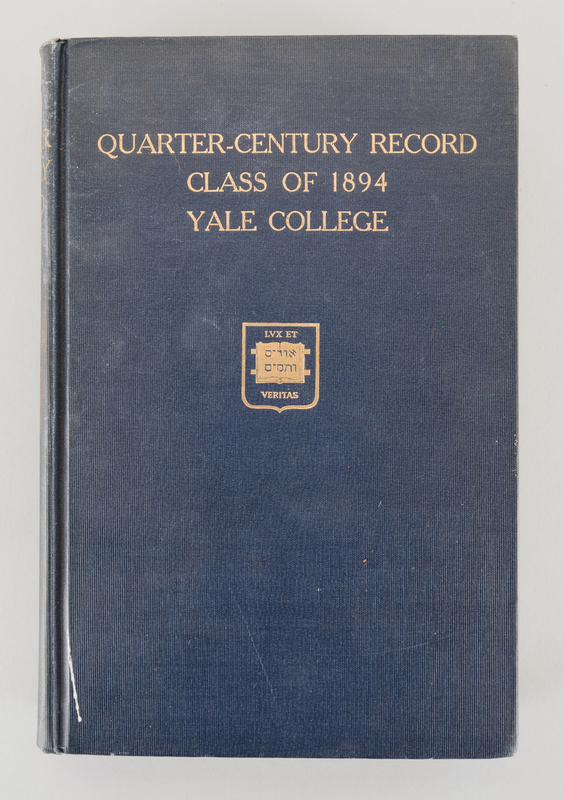 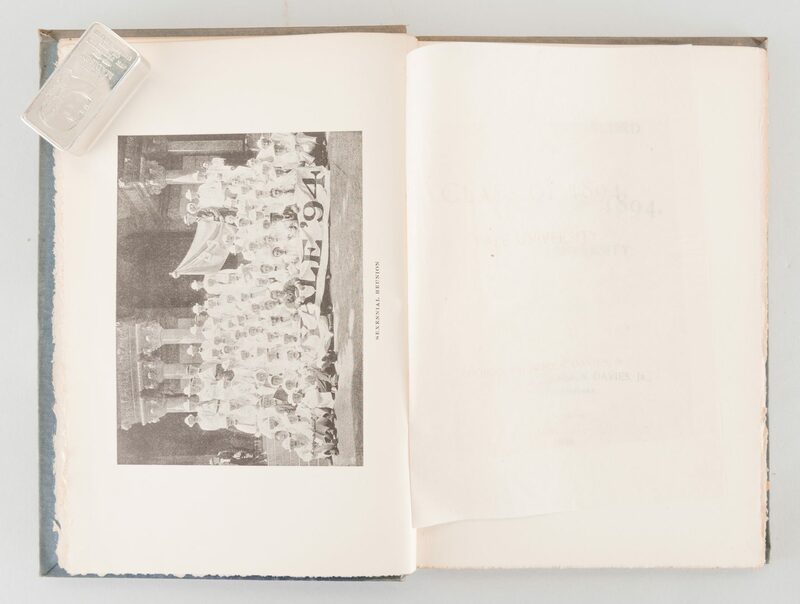 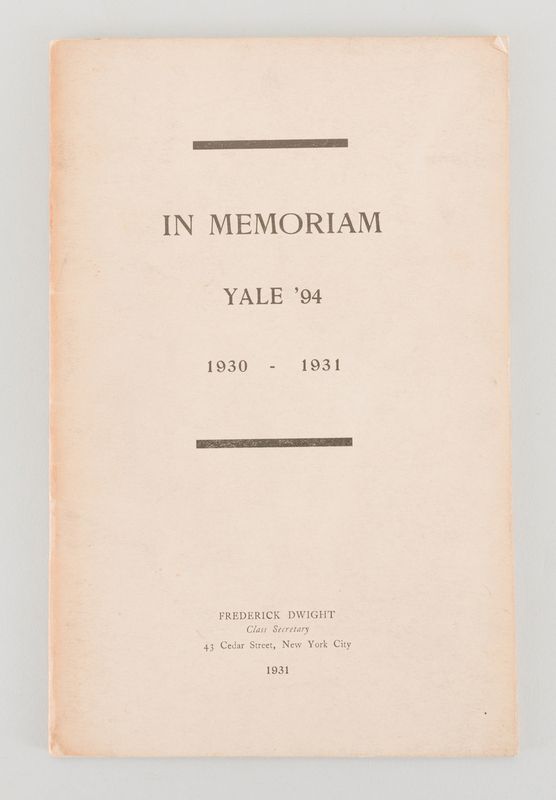 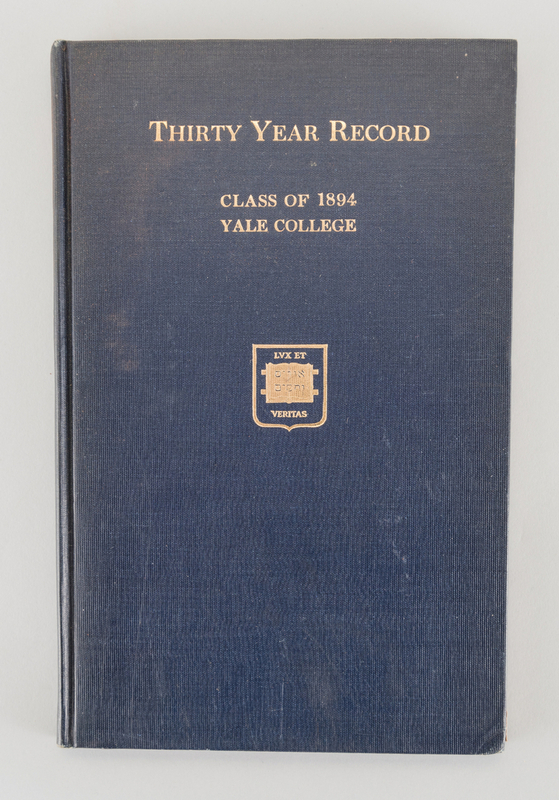 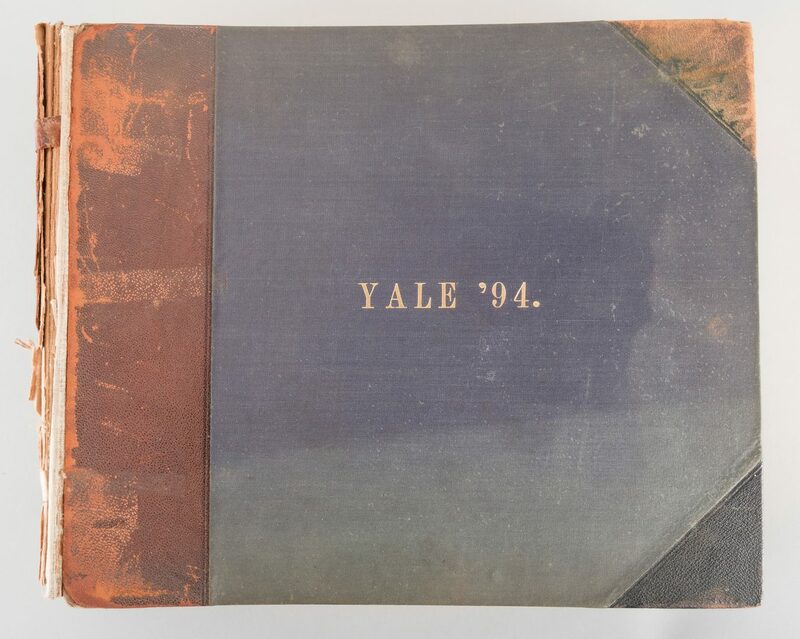 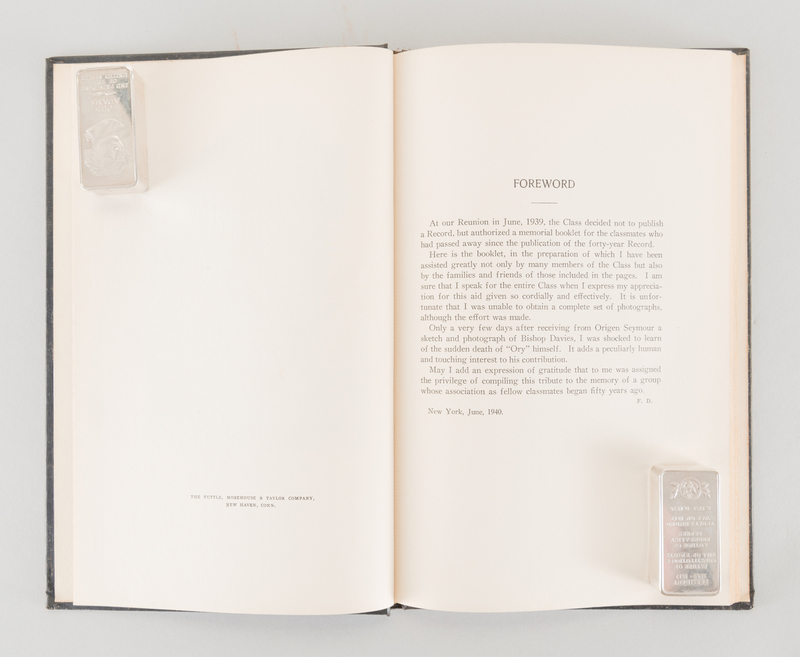 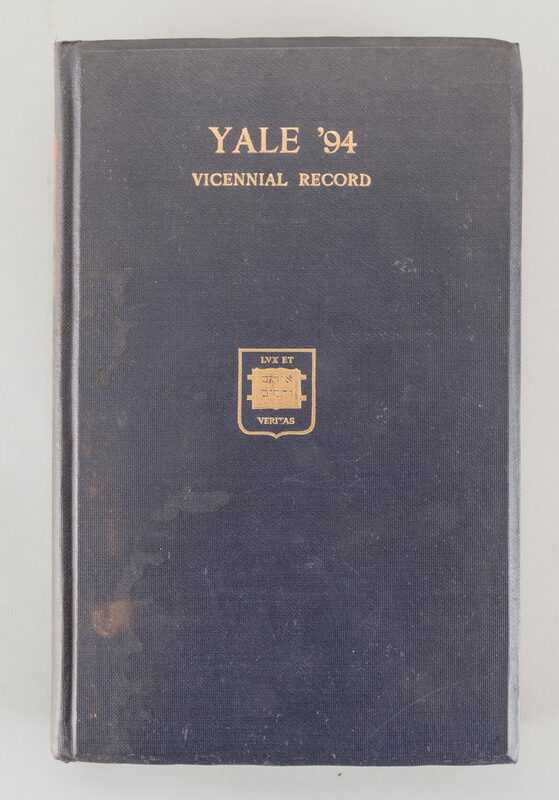 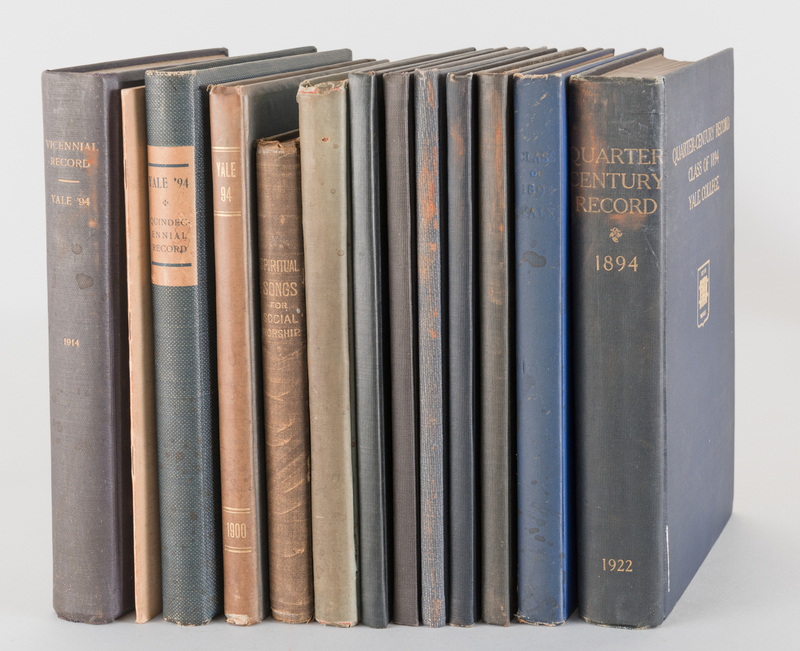 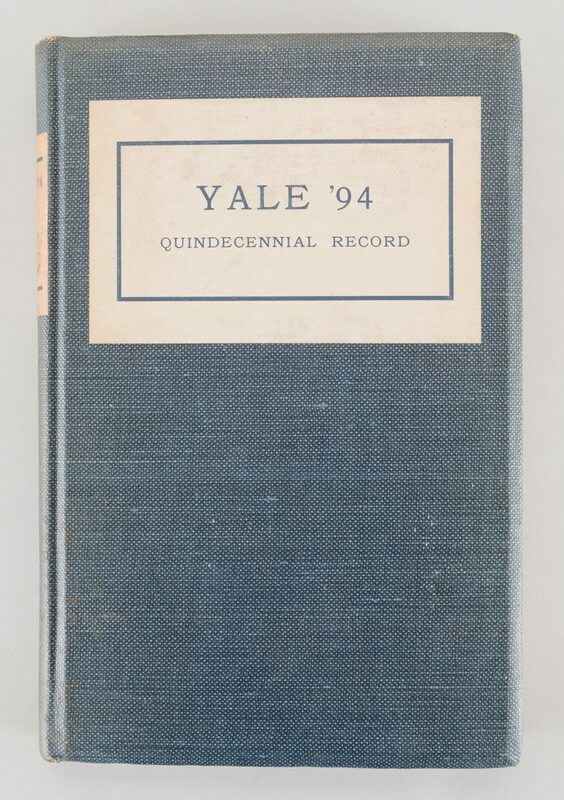 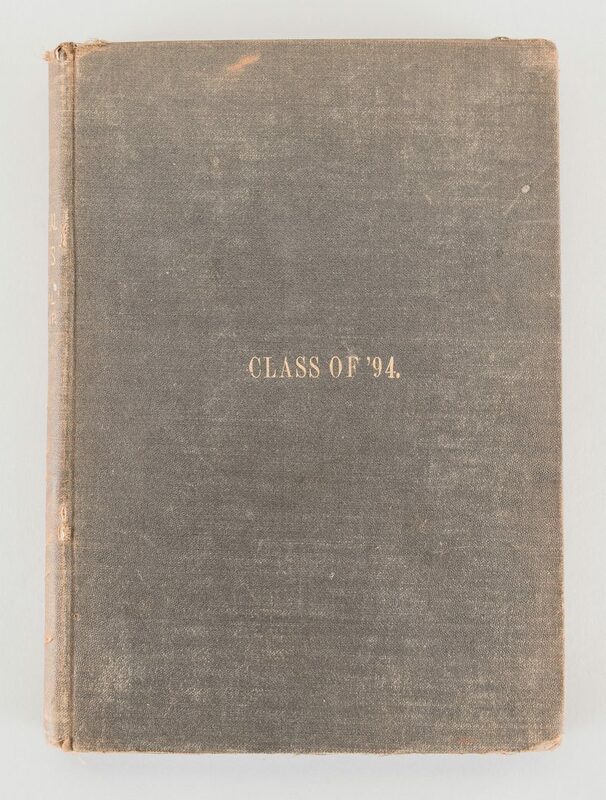 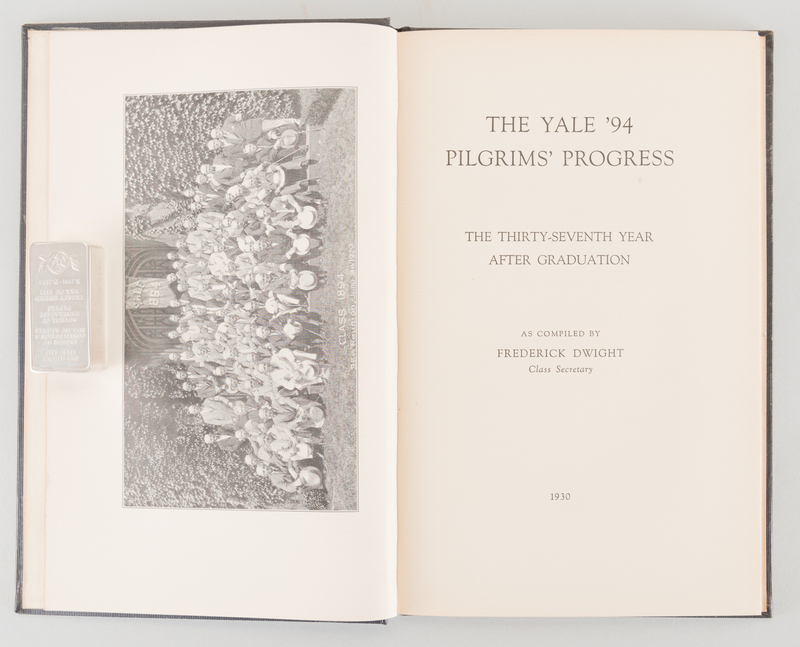 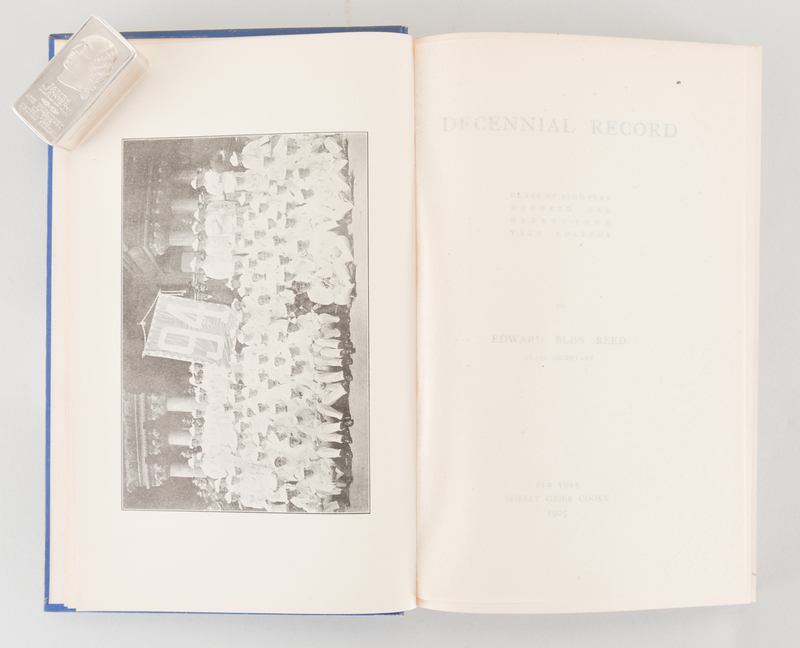 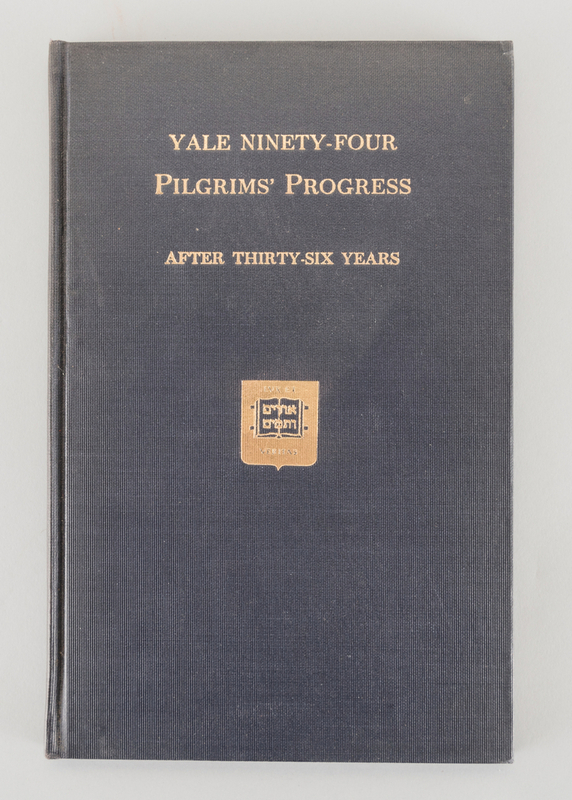 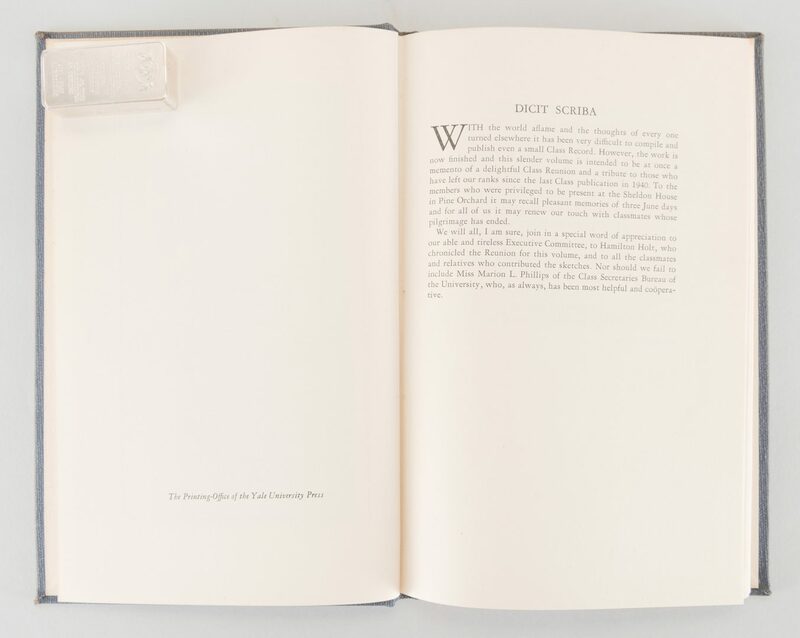 Also included is the Yale '94 Album with half-calf leather binding enclosing printed photographic images and printed signatures of the graduates. 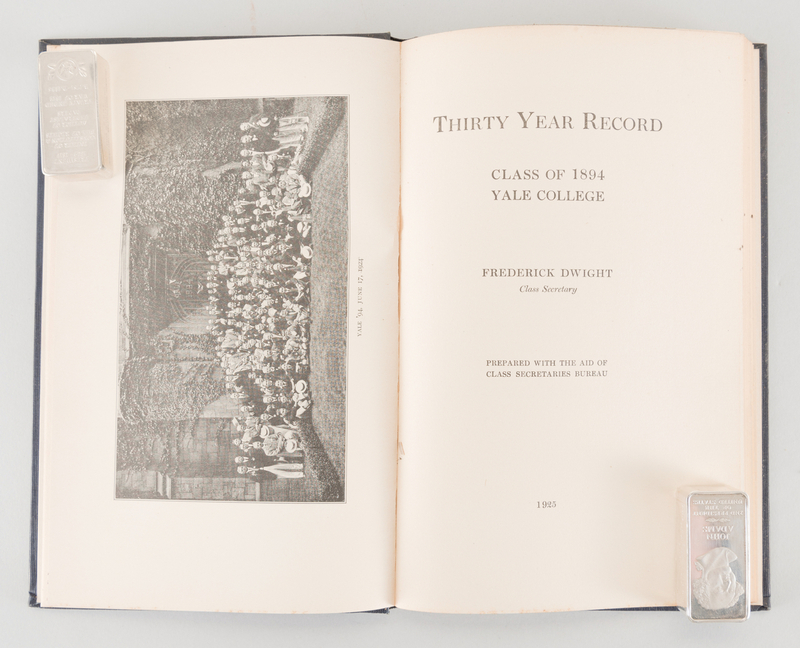 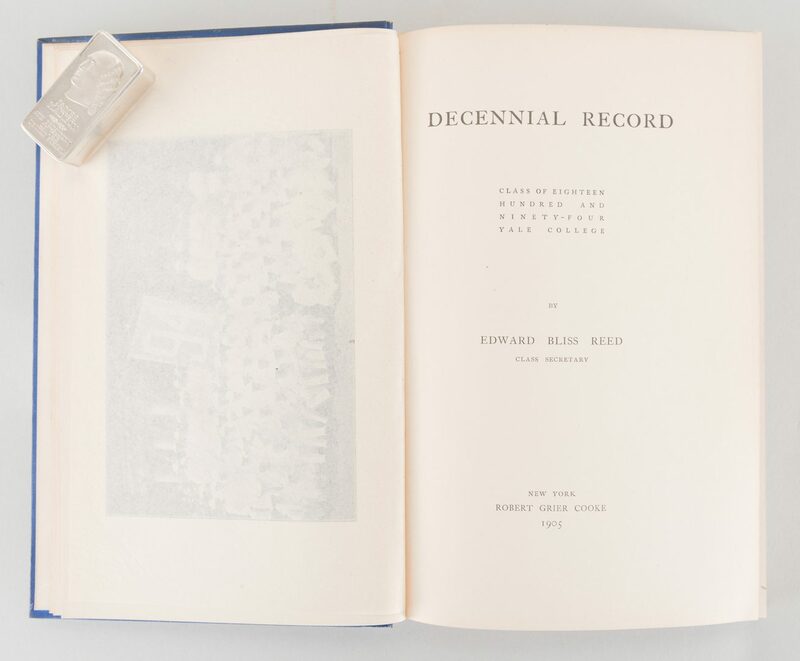 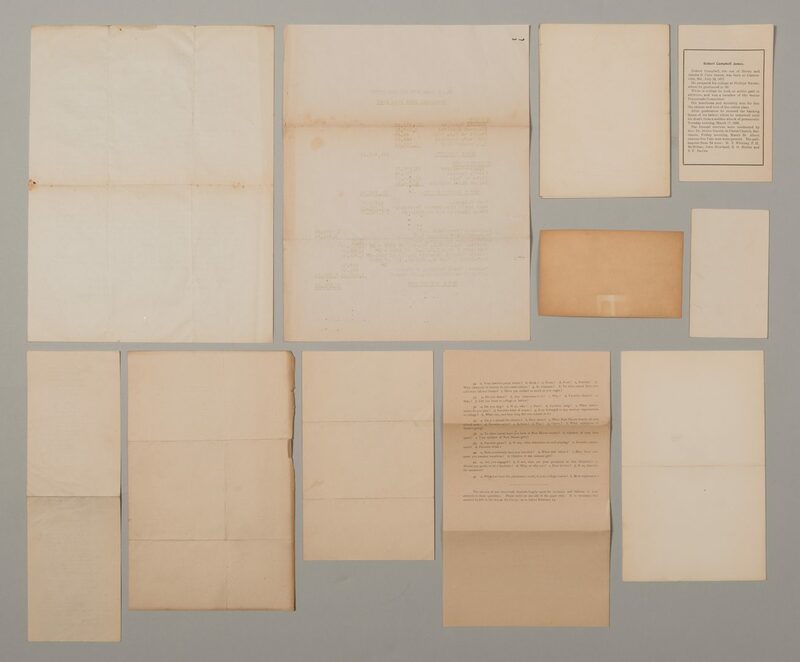 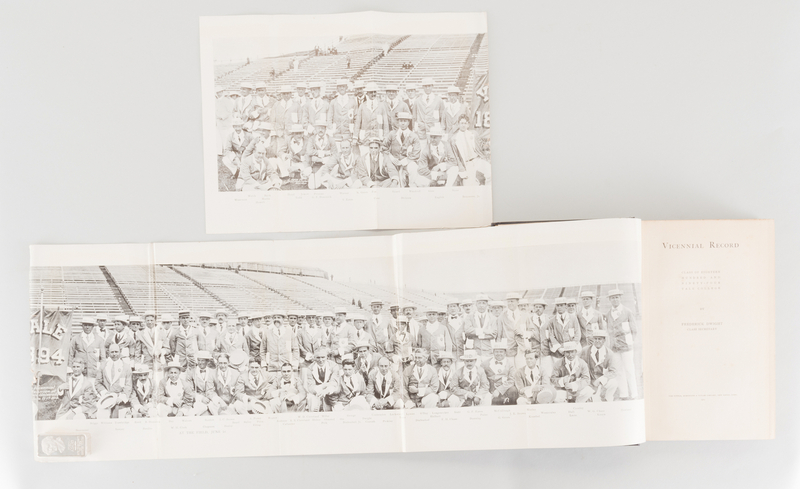 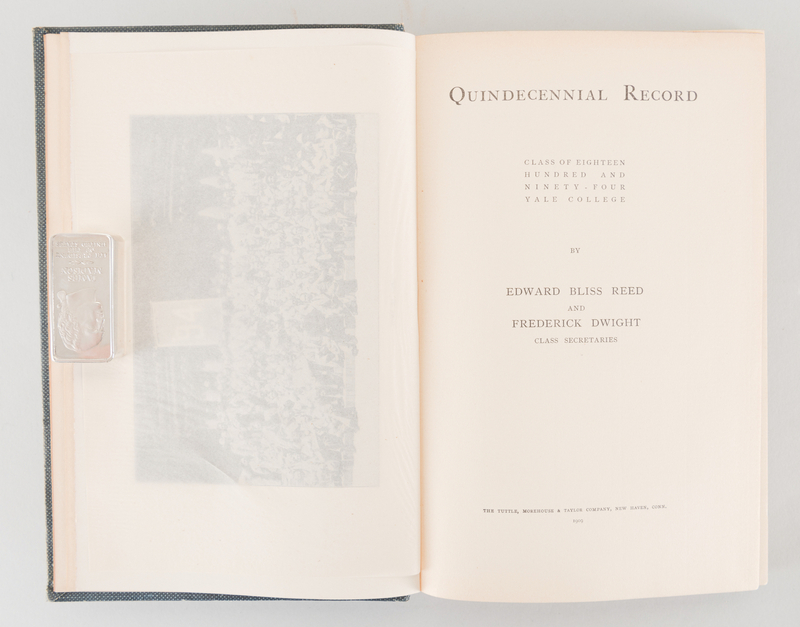 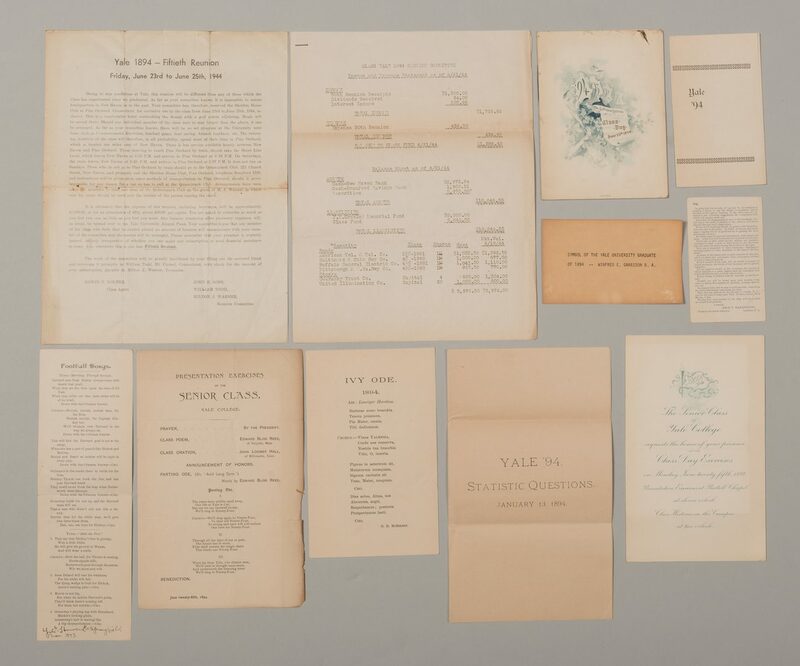 The archive also features an assortment of ephemera: Class Day Program, circular letters, Presentation Exercises program, Football Songs Flyer, and informational sheet for "our last fiftieth reunion" in 1944, with reunion committee income and expense statement. 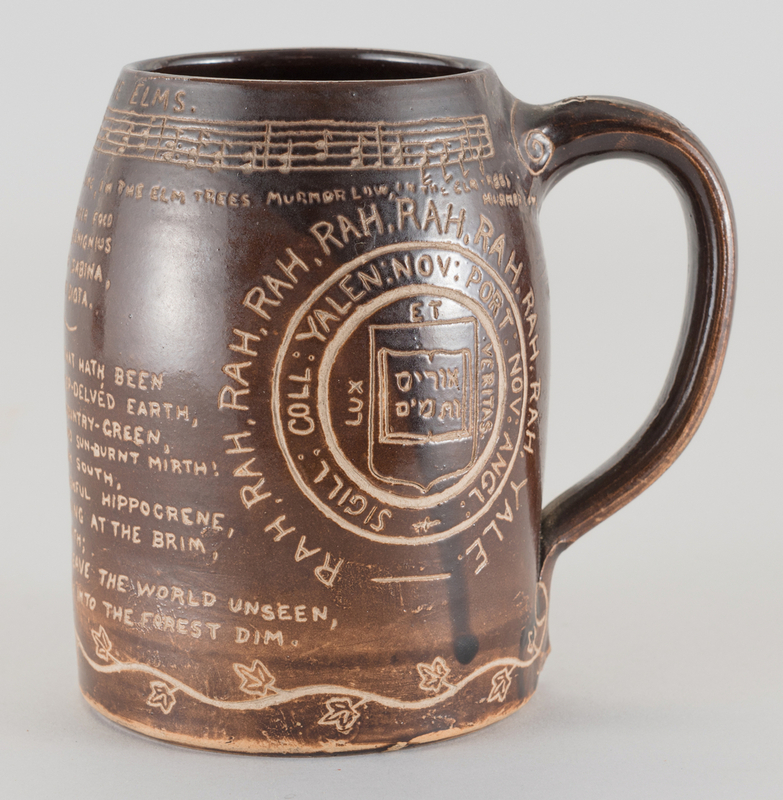 CONDITION: Mug: some wear/abrasions to lower edge beneath poem and wear to lower rim, overall good condition. 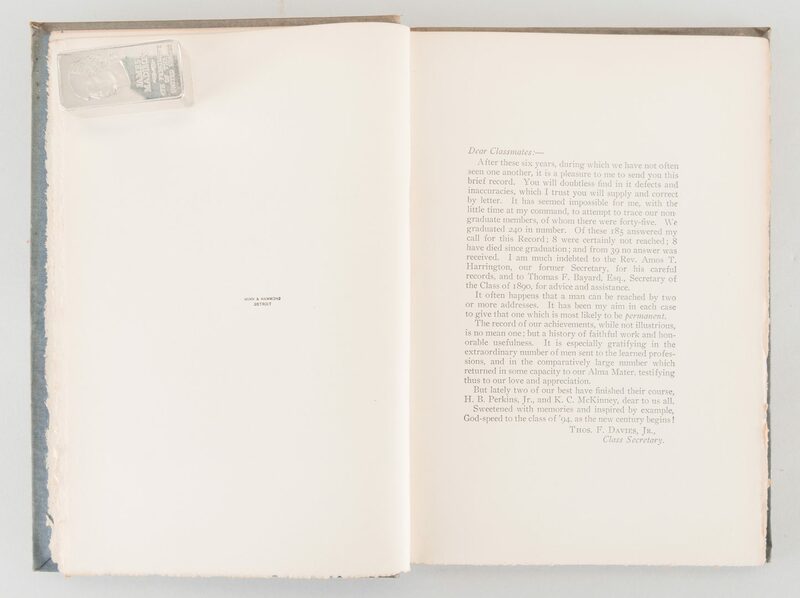 Album: Spine chipped and loose, cover faded and worn; contents appear complete, interior pages very good condition. 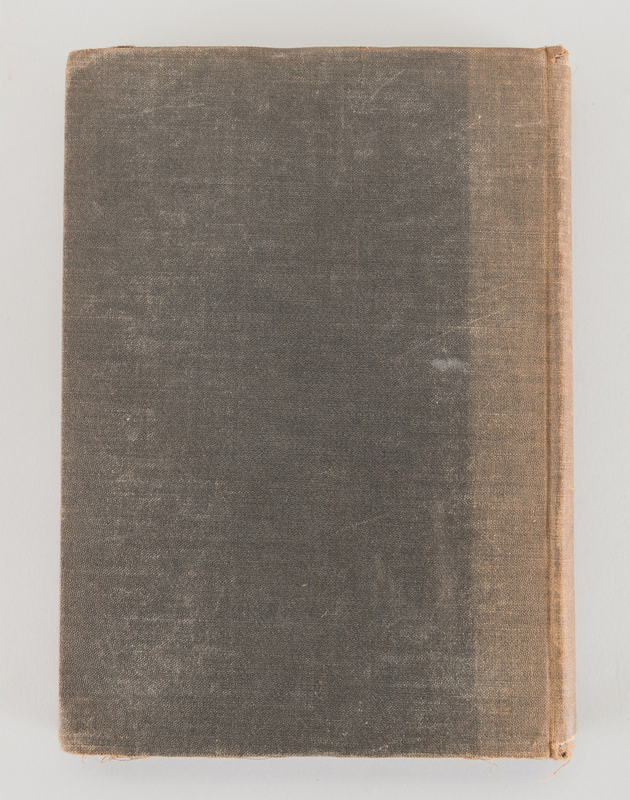 Other books: Generally good condition with some fading and light wear to boards. 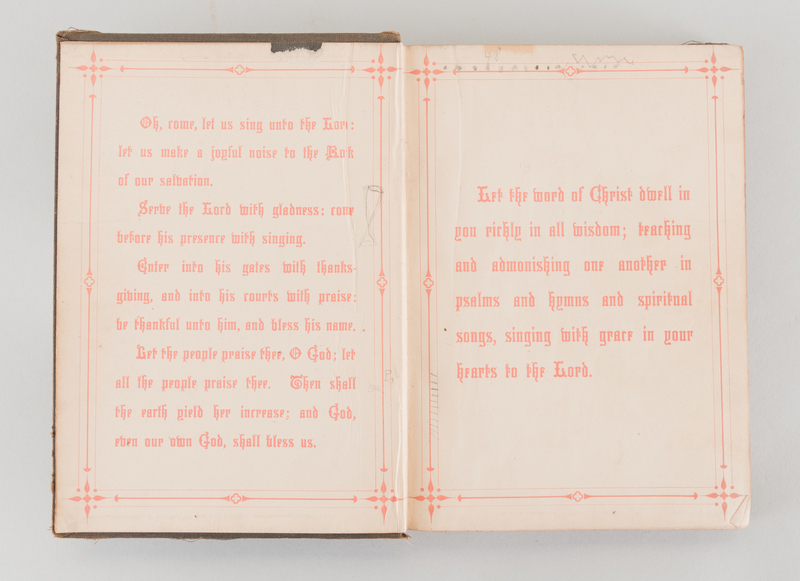 Songbook particularly worn, faded and scuffed, but intact. 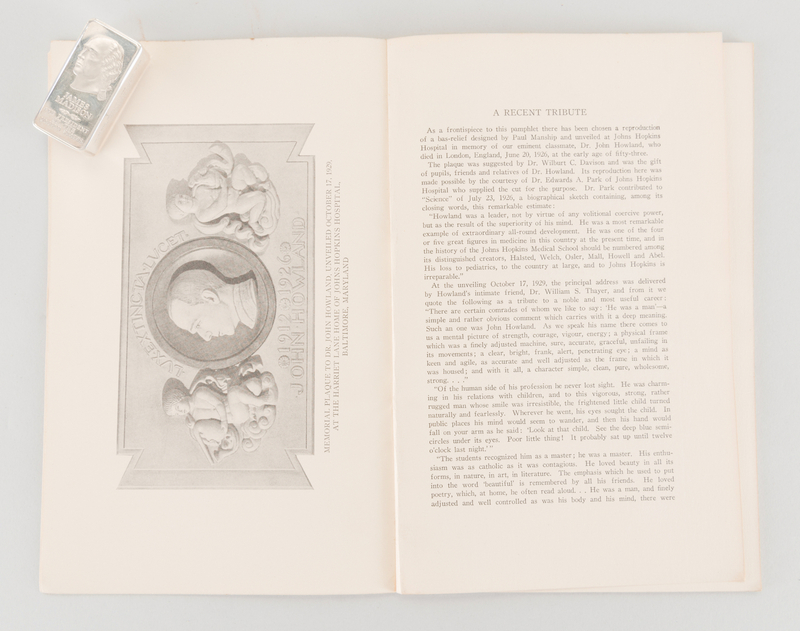 Ephemera in overall good condition with light toning, a few scattered small stains and light edge wear.